The folklore of French Detroit has slowly been returning to public awareness for a few years now, through the Marche du Nain Rouge, activities of the Detroit Drunken Historical Society, and increased interest generally in the early history and culture of Detroit. I was happy to be able to contribute a short essay to the Encyclopedia of Detroit on 19th century folklorist Marie Caroline Watson Hamlin, a member of an old Detroit family who retold many tales passed down through her family. 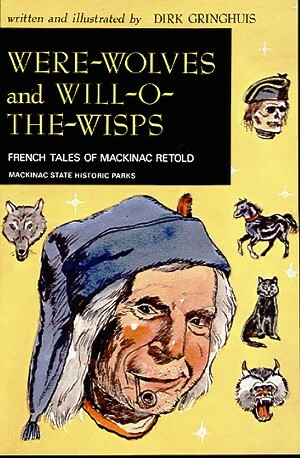 Were-Wolves and Will-O-The-Wisps: French Tales of Mackinac Retold, published in 1974, draws on Hamlin’s work as well as that of prominent 19th century French-Canadian scholars Honoré Beaugrand, Charles Marius Barbeau, and Philippe Aubert de Gaspé. Richard Gringhuis’ own professional background was well suited to the task. He worked for the publications department of the Mackinac Island State Park Commission since 1958, was a Michigan TV host, and an associate professor of elementary education. His work was acknowledged with awards from the Governor and the Michigan Historical Society. Gringhuis clearly drew on a deep knowledge and interest in the earliest recorded European history of the Great Lakes, and the oral legends of both the French and First Nations in this work. His retelling of legends recorded by Hamlin and others are easy-to-grasp tales for children and adults alike. The collection begins with an ‘honor roll’ of sorts of the earliest French and Métis families to reside in the Straits of Mackinac, many of whom have descendants there today. He builds interest in the stories by contextualizing them, placing them properly in the era of the fur trade. He did not shy away from the use of French, which brings another level of smart storytelling to the collection. In some ways, however, this 1972 book is as dated as Hamlin’s romantic 1882 collection. The language seems dated and the images are rustic. Yet these are timeless stories, which carry with them culture, history, and moral lessons. Some are just funny, others a bit scary. They would indeed be well-told around a campfire and they should be — for the next generation might well forget. The main weakness of the collection as it stands today however is in the illustrations, which could use updating. This collection could be an excellent opportunity for re-interpretation by a graphic novelist. The tales of New France and the stories that represent the meetings of European and First Nation cultures are important legacies in their own right. All of the stories continue to be retold by new writers and raconteurs today and provide the impetus for cultural events. In some ways, the magic of the stories rests in their relative obscurity. But once encountered, the stories take hold of a person’s imagination, and have a lasting impact. The proof is in their staying power, passed down now for centuries. Gringhuis’ work was a great contribution to the persistence of the French, Native, and Métis lore of Michigan, the Great Lakes, and Canada from an era long passed. Recommended for children and adults.